When I was growing up I shared a room with my older sister Christen. We shared everything, even if she didn’t know it. We even shared a bed until I was somewhere in the double digits. We had a bathroom attached to our bedroom that was really basic. A couple sinks, formica counter-tops with wood trim, and forest green plush carpet. Yep. Carpet in a bathroom. It was completely functional and nothing more. Over the years we “decorated” it with spilled nail-polish and dripped hair-dye. I can understand now, as a parent, why decorating our bathroom fell on the priority list somewhere near cutting down the weeds along side our dirt road. I can see how it seemed like a pointless pursuit. But now I’m all grown up. And still sharing the bathroom. Luckily I have boys and so I don’t see any nail polish decorating happening in the near future (disclaimer: I’m not against dudes wearing polish). So I get to decorate it however I’d like, er, I mean, however we’d like. So if you’re a grownup who’d like to decorate your own bathroom (shared or non), check out these inspiring bathrooms to drool over and get those creative juices flowing. Credit to Martha Stewart for image. The mirror makes this simple bathroom so much more fun. I love funky stuff like this in surprising places. Credit to Google Images for image. I am a sucker for bold black and white stripes! Love it in a bathroom. Credit to Our House for image. This all white bath could look sterile if not for the whimsical curtain and striped valance. Credit to La Dolce Vita for image. The wallpaper and natural elements give this bathroom a foreign beachy feel. Credit to Flourish Design and Style for image. The simple sconces and mirror play well against this tiny bathrooms wall treatment. Credit to Bijou Lovely Designs for image. This small bath looks awesome with its clean lines and pop of red. Credit to DesignSponge for image. 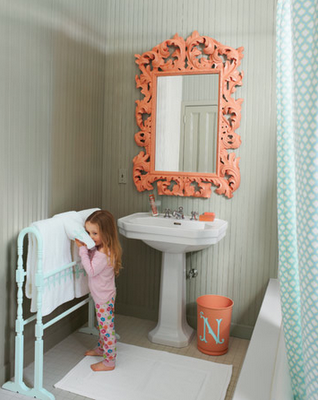 The tile and the adorable boat wallpaper make this bathroom fun for kids, or just adults who act like them. The dark cozy walls and fantastic gallery walls in this bathroom might entice someone to spend far too much time on the can. Inspired? Good. Then you’ll want to subscribe via email to receive updates on more awesome posts as well as tips and freebies. This week I will be posting my first real VIDEO tutorial on how I spray painted my bathroom cabinets and I KNOW you will kick yourself if you miss it. So subscribe to my Youtube channel and keep your eyes out for tons of great stuff to come. Thanks and don’t forget to live creatively!